(Nanowerk Spotlight) Transparent and flexible substrates are widely explored for flexible electronics (see: "The rise of flexible electronics") and researchers have been working on techniques to develop thermally stable and biodegradable materials that are as easily printable as paper. Last year, for instance, we reported on a transparent and flexible nanopaper transistor, developed by Liangbin Hu's research group at the University of Maryland. In new work, Hu's team has now reported a novel transparent paper substrate design optimized for solar cells. Reporting their results in the December 27, 2013 online edition of Nano Letters ("Novel Nanostructured Paper with Ultrahigh Transparency and Ultrahigh Haze for Solar Cells"), the researchers introduce a novel transparent paper made of earth-abundant wood fibers that simultaneously achieves an ultrahigh transmittance (∼96%) and ultrahigh optical haze (∼60%). The work was a collaboration with Prof. Jinsong Huang's team from the University of Nebraska-Lincoln, which led the demonstration of solar cell applications. "We demonstrated that simple lamination of transparent paper on solar cell devices can increase the devices' efficiency by 10-20% due to its high optical transmittance and light scattering," Hu tells Nanowerk. "Whereas displays and touch screens need high clarity and low optical haze, this is a property preferably maximized in transparent substrates integrated into solar devices," explains Hu. "This means that current commercial substrates are best suited for displays but are not optimized for solar cell devices. 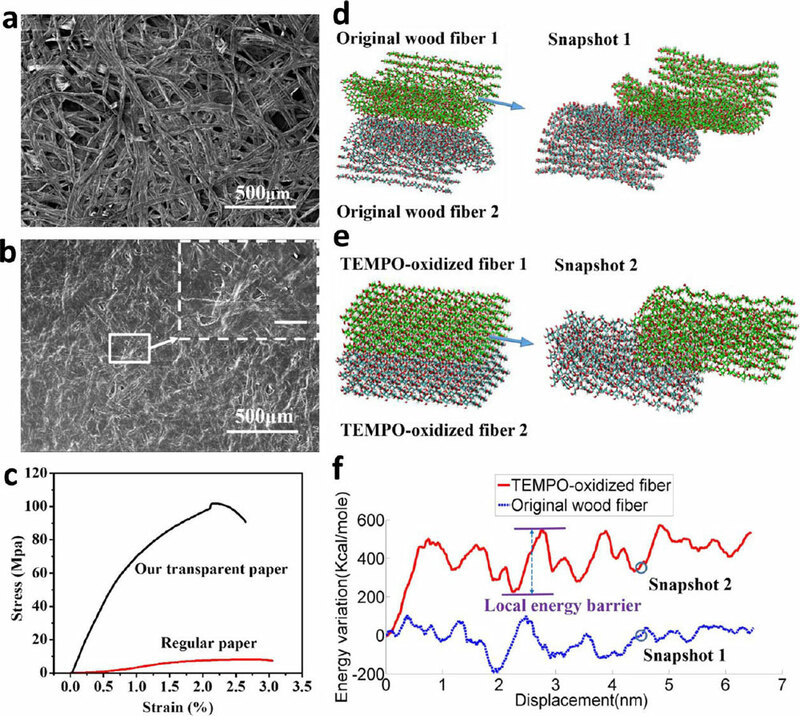 We developed a new paper-based on wood cellulose materials, which has both high optical transmittance and high optical haze." Transmission haze is an important optical property for optoelectronic devices and refers to the percentage of light diffusely scattered through a transparent surface from the total light transmitted. Higher transmission haze improves the light absorption efficiency of solar cells. Hu notes that the paper material's novel optical properties allow a simple light-management strategy for improving solar cell performances. Transmission haze tends to increase with an increase in paper thickness while the optical transmittance increases slightly with a decrease in paper thickness. Combining the optical haze and transmittance for substrates toward different applications allows fine-tuning of the desired results. "We demonstrated this with an organic solar cell by simply laminating a piece of such transparent paper and observed its power conversion efficiency (PCE) increased from 5.34 to 5.88%," says Hu. Additionally, the mechanical properties of paper – such as toughness and strength – are important for various applications. The team fabricated their transparent paper by creating a specially treated pulp from pine wood. This pulp was diluted with water and then dried as thin coatings. Hu points out that this transparent paper demonstrates a much higher optical transmittance than nanopaper made of nanoscale fibers while using much less energy and time to process paper with a similar thickness. "Such low-cost, highly transparent, and high haze paper can be utilized as an excellent film to enhance light-trapping properties for photovoltaic applications such as solar panel, solar roof, or solar windows," he adds. "We could also see uses in microfluidic devices as well as displays operating in a bright environment like outdoor GPS." Next steps for the team include integrating devices in transparent paper through scalable methods, and address the stability issues.